While Adobe and Apple have thus far been the reigning sovereigns of Mac-based photo management and workflow, Corel has now put some fresh competition into the arena with its new AfterShot Pro. Announced on Monday at CES, AfterShot Pro is targeted to photo pros and hobbyists. It seeks to compete on the same playing field as Apple's Aperture and Adobe's Photoshop Lightroom for the Mac, and is also compatible with the Windows and Linux operating systems. AfterShot Pro, based on technology from Bibble Labs, which Corel acquired last year, concentrates on photo management, non-destructive editing, RAW processing, and batch processing, while at the same time offering a flexible workflow. Photographers can use AfterShot Pro to do quick touchups and adjustments to RAW images and then integrate their process with other image-editing applications for deeper edits. "We see AfterShot Pro as a jumping off point, an adjunct to Photoshop," said Jeff Stephens, AfterShot's product manager and former president of Bibbel Labs. The program features a default gray unified window interface with a vast variety of visual and photo editing options. There are various ways to customize the workspace, and the flexible tabbed interface and panel system give the program a clean, professional look. On the left side, the Library, File System, and Output tabs afford access to photos and printing options. Lining the right edge of the interface window are editing tabs such as Standard, Color, Tone, Detail, Metadata, and more. Each tab, when clicked, offers additional options. A line of thumbnails, showing images in a folder, appears in a panel to the side of the main image. You can choose to hide or show the tabs and thumbnails and work in full screen mode. The program's advanced file system lets you drill deeply into your photo catalog to find the exact images you're looking for—shot by location, time, file format, rating, or even type of lens. 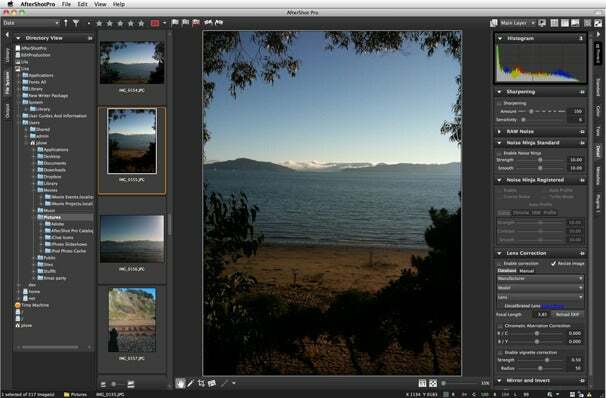 Within the tabbed interface, AfterShot offers all the standard image editing tools. A histogram shows the range of basic adjustments in real time. The program features a large number of customizeable presets, color correction and balance tools, exposure adjustments, sharpen, noise, and lens correction, and more. You can use layers to separate parts of a picture and apply different levels of adjustments to each part. 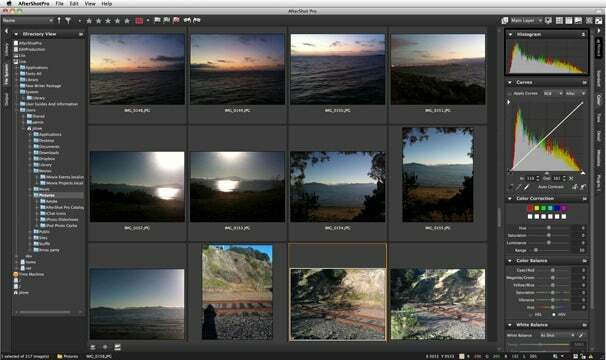 Noise Ninja, a noise reduction system, is built into AfterShot Pro. This technology is designed to strike a balance between noise suppression and detail preservation to provide natural-looking, artifact-free results. AfterShot is multi-threaded and optimized for multi-core and multi-CPU computers for faster output, conversion, on-screen performance, and image browsing. It’s designed to be especially effective in processing RAW images and provides maximum speed for on-screen previews, adjustments, and output. It supports a wide range of cameras including Canon, Nikon, Olympus, Pentax, Sony, Leica, Kodak, and others. AfterShot Pro offers a plug-in SDK that allows third-party developers to create proprietary plug-ins that work on RAW files. The program ships with a Black & White conversion plug-in that lets you restore one or two colors back into an image. AfterShot Pro plug-ins work seamlessly with undo/redo commands and editing-history tools. AfterShot Pro also features advanced batch-processing tools. You can rename multiple images, apply the same adjustment settings to groups of similar files, or convert and export photos to a pre-defined size and format. 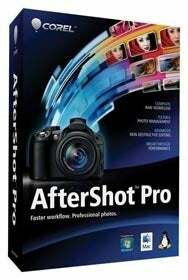 Corel AfterShot costs $100 and will be available for electronic download on Monday. Boxes in North America will go on sale January 24. The program is compatible with Intel Macs running OS X 10.5 and higher. The program will be available in English, French, German, Italian, Dutch, and Japanese.